Guido Alpa's Tradition and Europeanization in Italian Law provides a fascinating insight into the interplay between the different European legal traditions and the process of Europeanization. The book takes the reader on a voyage through the fundamental problems of European law, drawing on Professor Alpa's learning in the laws of other countries, and also in European Union and European Human Rights law. 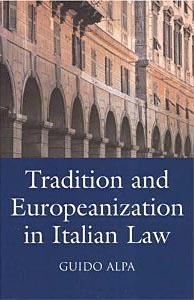 Tradition and Europeanization in Italian Law is a great achievement of scholarship. It assists us in understanding Italian law, but also our own law, and what European law is and might become. The Right Honourable Lord Slynn of Hadley, Lord of Appeal and former Advocate General and Judge of the European Court of Justice. "Tradition and Europeanization in Italian Law"